At this stage of this race Grant Hackett was well ahead of Ian Thorpe but was caught just prior to the finish. The rivalry between Grant Hackett and Ian Thorpe over 400 m will be one of the classic features of competitive swimming at least until after the 2000 Olympic Games. Frame #1: The left arm has just entered the water fully extended. Turbulence created by the left arm can be seen. This creates detrimental drag resistance. The right arm is still propelling forcefully although near the end of adduction of the upper arm. The hand/forearm is the propelling surface. The left leg begins to kick to counter-balance the vertical force component created by the right arm pushing up and back. Streamlining is not good probably disrupted by the breathing action - the head has lifted and turned to the right. Note how the thighs and hips are well below the torso and at an angle relative to the horizontal lane line in the background. Frame #2: The left arm continues extended forward, creating resistance, and sinking slightly. The right arm extends with the hand moving back and up. The left leg kicks to counter-balance the extraction movement. The head is still "lifted", as inhalation is about to begin. Frame #3: The left arm continues extended forward, creating resistance, and sinking slightly. It is highly probable that the left arm, its direction being largely vertical with a small horizontal and forward component, also creates a beneficial weak lift force. The right arm is being extracted from the water. The left leg kicks but the foot is also dorsi-flexed creating substantial drag resistance (as demonstrated by the milky turbulence coming off the bottom of the foot). Often drag forces developed by a non-streamlined foot are corrective actions. Usually, foot dragging corrects a torquing force. The head has turned fully to the right and inhalation begins. The turning motion has lowered the top of the head deeper into the water causing the hips and thighs to rise improving streamline. Frame #4: The left arm begins to be repositioned to create effective forces. It is pressed down well in front of the swimmer. To counter-balance its vertical force component the right leg kicks. Inhalation is completed. Streamlining is good with the head aligned horizontally. Frame #5: The left arm presses down and creates a forward propulsive lift force. Slight adduction of the upper arm generates the movement force and flexion at the elbow and wrist better facilitate productive force application. The direction of the turbulence following the hand indicates the direction of the drag forces being created. They are largely vertical but there is some horizontal component. The vertical force partly supports the rapidly recovering right arm. The left leg is positioned preparatory to kicking. The head is being turned back into the water. The recovering arm is near its zenith. The shoulders and hips are turned at approximately the same angle, that angle being the largest demonstrated in this stroke sequence. Frame #6: The adduction of the left upper arm slows momentarily as the upper arm is medially rotated and further elbow flexion occurs. This promotes an "elbow-up" position providing a more vertical alignment of the hand/forearm-propelling surface. The change in drag force production is illustrated by the trailing turbulence now being largely horizontal. The head has turned back under the water. The recovering right arm is forward over the water. The shoulders begin to rotate back to the right. Frame #7: Upper left arm adduction occurs rapidly with the propelling surface of the arm still angled but mostly vertical. The right arm enters well in front of the swimmer. The left leg kicks to counter-balance the rapidity of the recovery and entry. It should be noted that the speed of Grant Hackett's recovery is very fast, taking less than .4 of a second. This rapid recovery will cause some compromises to the propelling movements of the left arm but will also minimize detrimental vertical forces created while it is out of the water. Frame #8: Left arm propulsion continues with the hand/forearm-propelling surface almost vertical. Power is supplied by adduction of the upper arm. The shoulders are flat, which means the propulsive force will be outside of midline. The torque produced by the pull is "corrected" by the drag force created by the left foot being dorsi flexed, a similar situation to that depicted in Frame #3. This drag force will retard forward progress, as it constitutes a "braking" action in a manner similar to that of a rudder. The swimmer's alignment demonstrates good streamlining. Frame #9: The left arm has rapidly moved to exit the water. The right leg kicks to counter-balance forces created by that exit. The right arm is still extended forward. At this stage there is no major propulsive force being developed. Frame #10: As the exited left arm rises in recovery, the right leg completes its counter-balancing kick. The right arm begins to be forced down, some of its vertical force component also being used to counter-balance the left-arm exit. The left leg is raised ready to kick to counter-balance the initial mostly vertical movement of the right arm. 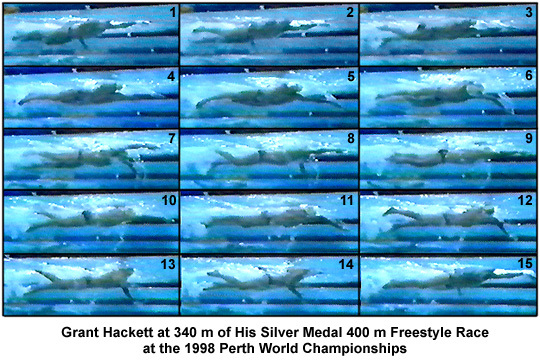 This frame shows that Grant Hackett's movements are not simple but a complexity of counter-balancing actions. Frame #11: The right upper arm remains high as it medially rotates. The elbow flexes and repositions the hand/forearm-propelling surface to an "elbow-up" position. The shoulders are relatively flat to accommodate the fast recovering left arm. The head starts to rise to look forward. Frame #12: Right arm propulsion has the propelling surface angled and pushing backward. The arm's angled position means that some vertical force component is created which is probably used to contribute to supporting the recovering left arm. The propelling arm is sweeping backward and to the side. The left leg creates a corrective braking force to keep the swimming moving directly forward (note the turbulence coming from the bottom of the foot). The head looks directly forward. Frame #13: Propulsion with the right arm continues but outside of midline. However, as the left arm reaches forward readying for entry the swimmer's head is lifted directly upward. Its effect on streamlining is obvious and it also explains why the poor streamlining demonstrated in Frame #1 occurred. The left leg is dragged even deeper, the lift component created at least partly counter-balancing the large vertical force created by the lifting head. Frame #14: The right arm pull is more centered than previously as adduction of the upper arm is completed and the forearm is rotated inward partly under the body prior to extending in the latter part of the propulsive phase. The right leg kicks to counter-balance the recovering left arm. The head is now lifted high causing the body to "angle" out of efficient streamline. Frame #15: The position of Frame #1 is replicated. Grant Hackett is an outstanding distance freestyler. As with many of today's champions there is still room for improvement in his technique. His head-lift and breathing action causes compromises in technique as well as disrupting streamline. Grant Hackett's recovery also causes his pulling action to have considerable lateral forces involved to counter-balance the side-sweep of the recovering arm. Emphasizing a very tight elbow bend very early in the recovery action could possibly reduce this. That would reduce the amount of lateral sweep in the recovery, particularly in the early part. That should result in the early stages of propulsion being more direct than currently exhibited. It is likely that the "braking" action of the feet would also be reduced. The correction of these factors should be evidenced by a reduction in or eradication of the "braking" foot actions at the end of each kick. It would be worthwhile to experiment with more shoulder roll in this swimmer's stroke. The added rotation would facilitate positioning forces of propulsion and recovery more above and under the midline than is currently evidenced. Grant Hackett is a young world-champion who should improve markedly in the future.